Have You Heard Phoenix? Steel Vape Phoenix Kit & Mod! Have you heard Phoenix, which is the ancient mythical role of China, like dragon. Actually, in the traditional Chinese concept, dragon stands for men, and phoenix stands for women. The rebirth of the phoenix through the fire indicates that people make a big success after he goning through a lot of difficulties. See these two items, do you like phoenix? 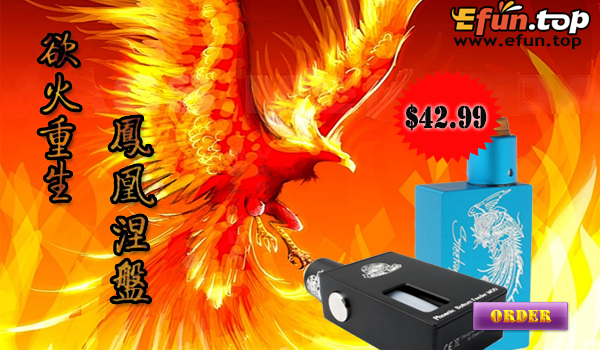 1,The Steel Vape Phoenix Kit consists of Steel Vape Phoenix Squonk Box Mod and Phoenix BF RDA. 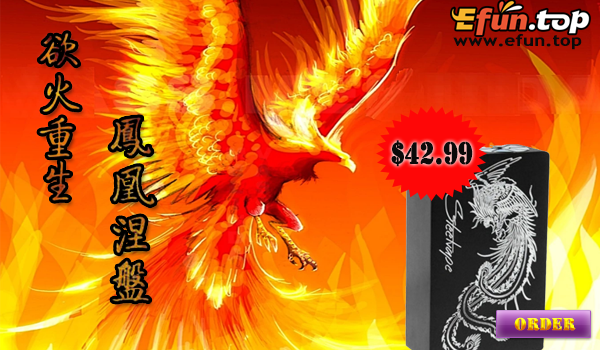 2,Steel Vape Phoenix Mod is a bottom feeder squonk mechanical box mod with 7.5ml food grade silicone squonk bottle. It is powered by one single 20700 battery or 18650 battery with fireproof PC adapter tube. The back cover panel can be attached to the mod with 5 magnets on each side. You can get it just for $29.99on efun.top!